With a focus on both fraternal knowledge and professional development, pledges will explore the basics of what it means to be a brother and the key practices and skills needed to succeed as a principled business leader. Introducing pledges to the brothers and the chapter begins on day one. Throughout the program, pledges will start building meaningful relationships and acclimating to the chapter culture. A comprehensive program is not complete without resources for everyone involved. With specific resources for fraternity educators, pledges, and chapter advisors, everyone can feel prepared for the process. Bridge to Brotherhood, also known as “The Bridge,” is Alpha Kappa Psi’s pledge education program focused on fraternal traditions, key educational skills, and local contexts. Bridge to Brotherhood is a highly-customizable five to eight-week program comprised of six educational modules, as well as Induction, the Fraternal Exam, Mid-Term Interview, Court of Honor Presentation, Initiation, and New Brother Orientation. Over the course of Alpha Kappa Psi’s pledge education program, pledges are introduced to the key skills and practices of the Fraternity. Bridge to Brotherhood is designed to target areas of personal and professional development regarding how to become a principled business leader, as well as build an awareness and appreciation for the history, values, and vision of Alpha Kappa Psi. To get started with the Bridge to Brotherhood program, the Fraternity Educator must first complete the Bridge to Brotherhood Program Syllabus and submit it by May 15, 2019, for the fall 2019 semester. If a chapter does not submit the syllabus by the due date and receive approval by the chapter educational resource coordinator, they will not be eligible to add on chapter electives or Brother Interviews for that term and will be expected to only deliver the educational modules and rituals. Several webinars are available to assist you in implementing the Bridge to Brotherhood Program. Take a look at the webinars below, and choose the one that works best for you. Here is everything you’ll need to know to start planning the Bridge to Brotherhood program. View the Facilitator Guide, Chapter Advisor Manual, and Module Presentations below. Review them now so you are prepared to deliver the program later. As a fraternity educator, you’ll be responsible for customizing and delivering the program to the pledge class. Chapters might have various names for this role, including, but not limited to: vice president of membership and pledge educator. 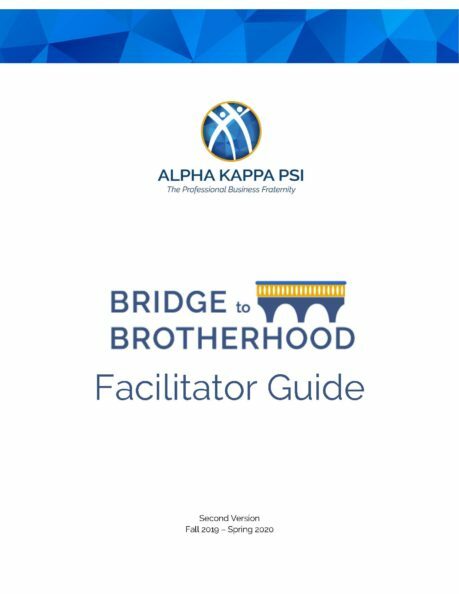 The Facilitator Guide should be used by the person or people in charge of ushering your pledges into the Alpha Kappa Psi brotherhood. For the five to nine weeks of pledging, the program should require no more than five (5) hours a week of time in total, including meetings, elective attendance, and preparation, as well as time spent interviewing and networking with brothers. As everyone requires a different amount of preparation, time spent studying for the Fraternal Exam may be in excess of this time frame. The Bridge to Brotherhood program works best when you customize it to fit the needs of your chapter. Choose from a list of more than two dozen electives to create a unique experience for your pledge class. Prospective members can learn about Bridge here.